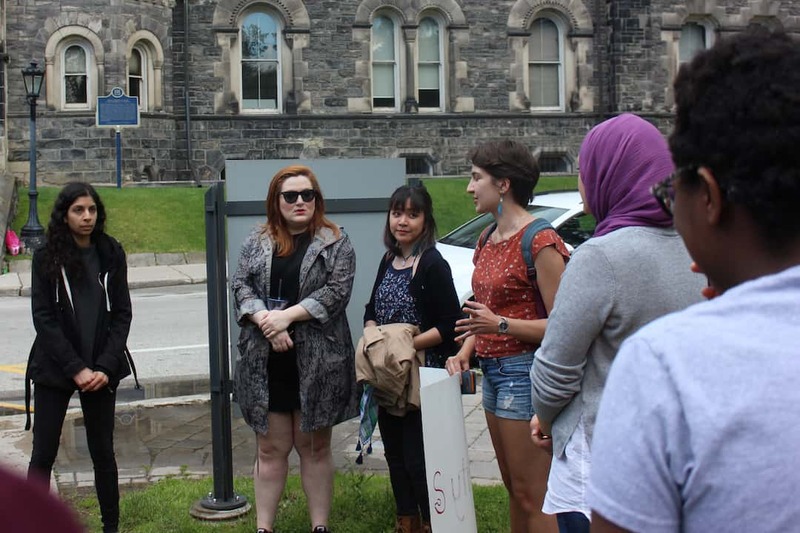 On the afternoon of May 30, protestors rallied around the University of Toronto Students’ Union (UTSU) office in response to the union’s decision to lay off two full-time staff members. The decision to lay off Clubs and Service Groups Coordinator Vita Carlino and Health and Dental Plan Coordinator Maria Galvez was the culmination of what started as a contentious campaign issue for many members of the UTSU executive. Five of the seven executives, now a month into their tenure, ran on the Demand Better slate and vowed to cut staff in the coming year for a more secure financial future for the union. The students gathered around the union to criticize its decision, arguing that eliminating the two staff members and their respective services was both unjust and a detriment to the total services offered to students. The UTSU subsequently released a statement on the elimination of the two positions and their respective services. Andre Fast, a UTSU presidential candidate in the 2017 UTSU elections and an active campus organizer, was also present at the rally. Fast also raised concerns about the transparency of the union and the way it communicated with students on the reduction of services. Moving forward, Fast says that a new campus group called ‘Save Our Services, Support Our Staff,’ which is entirely student-run will be advocating for the continuation of services that they say are important to students. The UTSU “is proposing to cut services that are important to students. We are calling on the UTSU to rethink their plan,” states the group’s Facebook page. Fast said they have been working to collect petition signatures on campus. The group currently boasts almost 500 signatures. Although the decision to cut the jobs previously held by Carlino and Galvez has already come to fruition, it remains unclear whether the debate surrounding their jobs and the services connected to them is over. This is not the first time the UTSU has been met with protests for its decision to eliminate the two staff positions. Protestors disrupted board of directors meetings in March and April as well as during the Annual Ratification Meeting in April. Carlino and Galvez declined The Varsity’s request for comment at the rally. The Varsity has reached out to CUPE 1281 President, Orion Keresztesi, for comment.